Well, this will be a fine sight for sore eyes for many iPad users. 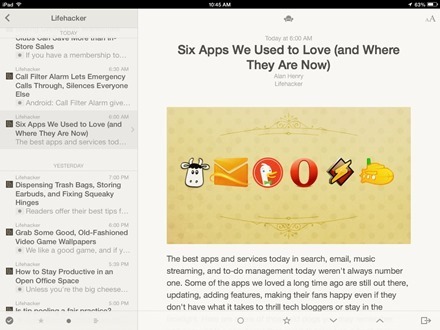 Reeder is back, and ready for the Post Google Reader world we now live in for RSS readers. 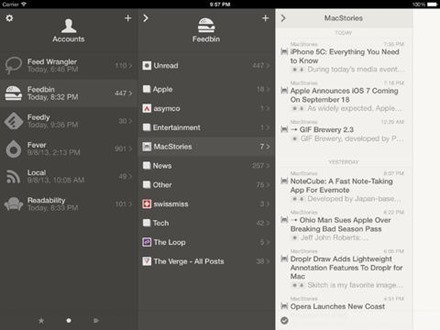 Reeder 2 for iPad and iOS hit the App Store today. Reeder was always among the most popular RSS reader apps for iOS in the old days of Google Reader sync being an absolutely essential feature in these apps. I was a latecomer to appreciating the app, but grew to having it as my go-to RSS app with a prime spot on my first home screen – and selected it in our list of the Best iPad Apps of 2012. Reeder 2 is out with support for a number of the best new syncing options for RSS feeds. These include Feedly, Feedbin, Feed Wrangler, and Fever – and support for multiple accounts. Feedly has become my Number 1 RSS reader app over recent months, for a couple of reasons – it seems to me to be the service that has done the most to replace and surpass what Google Reader previously offered, and it has excellent apps across Android, iOS, and desktop browsers. 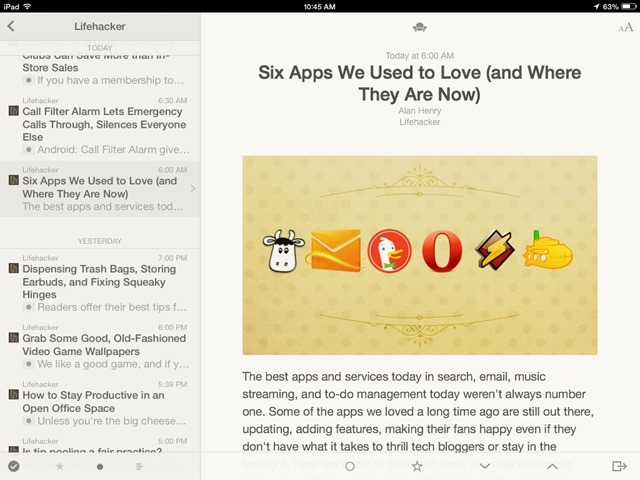 So I’m glad to see Feedly supported in Reeder 2 of course. I installed Reeder 2 on my iPad mini this morning. I’ve only spent a little time with it so far. It looks good but I’ll need to spend a lot of time with it now to see how it matches up with Feedly. Here’s an App Store link for Reeder 2; it’s priced at $4.99 and is a universal app designed for both the iPad and the iPhone.